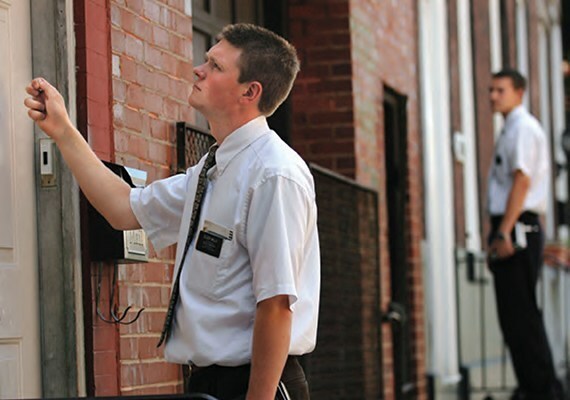 A doorstep encounter with missionaries from the Church of Jesus Christ of Latter-day Saints (Mormon) may allow only a brief moment to hopefully make a lasting impression, so we must weigh our words carefully. Too many Christians make the mistake of introducing peripheral topics that can sometimes head the discussion toward an agonizing dead end. Many times the Mormons are not familiar with their history or doctrines, allowing them to sometimes assume the Christian is either making something up or taking something out of context. But ask a Mormon, “If you were to die right now, do you have the assurance that all of your sins are forgiven?” The typical response is, inevitably, “I hope so,” “I think so,” or just plain, “no.” Why is this? In Mormonism, salvation is defined in two unique ways. Tenth LDS President Joseph Fielding Smith explained, “Salvation is twofold: General – that which comes to all men irrespective of a belief (in this life) in Christ– and, Individual — that which man merits through his own acts through life and by obedience to the laws and ordinances of the gospel.” (Doctrines of Salvation 1:134 (Salt Lake City: Publishers Press, 1956, Italics in original). General salvation, or resurrection from the dead, is known as salvation by grace and is provided to all people. It is synonymous with immortality since the resurrected person lives forever. The goal of a faithful Latter-day Saint is to achieve individual salvation or “exaltation,” which does not come easily. Thomas S. Monson, Mormonism’s current prophet, taught, “It is the celestial glory which we seek. It is in the presence of God we desire to dwell. It is a forever family in which we want membership. Such blessings must be earned.” (“An Invitation to Exaltation,” Ensign, May 1988, 56.) With this as a background, we can then proceed to remind them regarding what those requirements really entail. Using just six verses from two of the Standard Works and by asking a few questions, it’s possible to show how futile Mormonism’s plan of salvation really is. Bear in mind that these questions are asked within a context that a Mormon will understand. Ask: Does this passage say that it’s possible to keep all of God’s commandments? How are you doing at this? Ask: Do you struggle with sin? If so, doesn’t this tend to prove that you, as a Mormon, are still “in your sins” and are “unclean”? If you are, doesn’t this mean you are not saved? Ask: Have you denied yourself of all ungodliness? If not, doesn’t this verse tend to prove that you have yet to receive the grace that will cleanse you of your sins? If you have not denied yourself of all ungodliness, when do you think you will eventually do so? Ask: In light of the answers you’ve given to the above questions, do you think God will overlook your sins? With these quotes in mind, consider several common excuses used by many Latter-day Saints and the response to such objections from this Mormon president. Spencer Kimball utilized D&C 58:43 when he wrote, “There is one crucial test of repentance. This is abandonment of sin. Providing that a person discontinues his sin with the right motives—because of a growing consciousness of the gravity of the sin and a willingness to comply with the laws of the Lord—he is genuinely repenting….In other words, it is not real repentance until one has abandoned the error of his way and started on a new path.” (Ibid 163.) He later added, “The Lord cannot save men in their sins but only from their sins, and that only when they have shown true repentance.”(Ibid 166, emphasis his.) The problem, of course, is that most Mormons realize they have not met such a demanding requirement; hence, they have not “truly repented” in the first place. Many Mormons like to believe that their honest efforts to do the right thing are enough to achieve forgiveness. Kimball did not think so. He wrote: “Nor is repentance complete when one merely tries to abandon sin. To try with a weakness of attitude and effort is to assure failure in the sense of Satan’s strong counteracting efforts. What is needed is resolute action.” (Ibid 164, emphasis his.) He then related a story about a military officer who ordered a soldier to deliver a message. This officer became irritated when the soldier said he would try to carry out the order, even if it meant death. To this the officer replied, “I don’t want you to die, and I don’t want you merely to do the best you can, and I don’t want you to try. Now, the request is a reasonable one…Now get out of here and accomplish your mission.” (Ibid 164.) Kimball concluded, “To ‘try’ is weak. To ‘do the best I can’ is not strong. We must always do better than we can.” (Ibid 165.) Remind the Mormon that whenever a person uses the word “try,” it is almost always within the context of failure. For example, a person who climbs a hill will say he climbed the hill. He doesn’t say he “tried” to climb the hill. It is important to stress that we are not minimizing the role of good works. While justification comes by grace through faith and not by works, Ephesians 2:10 clearly states that believers were created for good works. Our works are the evidence of our professed faith. When we realize that salvation comes through what Christ did on the cross, it no longer becomes what we do but rather what He did. Unfortunately, Mormonism places an oppressive burden squarely on the backs of the LDS people. Forgiveness of sins provides the Christian peace that passes all understanding. By using the approach we’ve presented here, you will be challenging the Mormon to explain why Christians should surrender their assurance of forgiveness for something that the Mormons only wish they had.